I’m getting a lot of email and tweets about NASA supposedly having proof of a giant, Jupiter-sized planet orbiting the Sun way beyond Pluto. Let me be clear: while certainly possible, this idea is not at all proven, and in my opinion still pretty unlikely. As usual, this started as a more-or-less accurate media story and is getting inflated as it gets re-reported. As far as I can tell, the original report was in the UK paper The Independent. Here’s the deal. Two astronomers, John Matese and Dan Whitmire, have theorized about the possibility of a previously-undiscovered planet way beyond Pluto for some time. This is not a crazy idea; we see planets orbiting other stars way out, and there’s other evidence big planets can be pretty far out from the Sun (mind you, evidence does not mean proof). As it happens, there are lots of chunks of ice orbiting the Sun pretty far out as well. Some of these have orbits which bring them into the inner solar system, and we see them as long-period comets. 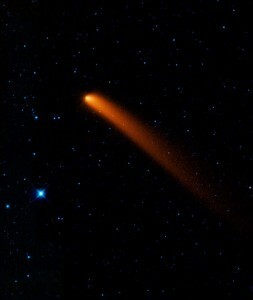 What Matese and Whitmire did was wonder how a big planet would affect the orbits of these comets. If you measured enough of them, would you see the effects of the gravity of this planet? They claim you can, and even gave the planet a tentative name: Tyche. I read their papers, and thought the data were interesting but unconvincing. The sample size was too small. A bigger study was done, but again the effects weren’t quite enough to rise to the level of breakthrough. I’m not saying the astronomers are wrong – the data were certainly provocative, and potentially correct! Just not firm enough. What I want to see are observations of this planet. And our best hope may be in the NASA satellite WISE – the Wide-field Infrared Survey Explorer, which has scanned the entire sky over the past year or so. A planet in the outer solar system may be warm enough to glow in the IR and be spotted in the WISE data. Note that first line: it makes it seem as if the proof of the planet is already in the data. We just need to find it! But that’s not really the case. This planet may not exist at all. It might, and I’d love for that to be true. But at the moment we just have interesting but inconclusive evidence supporting the idea of a large planet in the deep dark recesses of the solar system. That’s a long way from proof. I’ll note the popular site Gizmodo has an article on this that starts off well, but then goes even farther than the Independent did: “[Matese and Whitmire] claim that data already captured by NASA’s Wide-field Infrared Survey Explorer proves its existence. It only needs to be analyzed… over the next two years”. The Independent said that the astronomers believe the proof is there, but that’s different than actually claiming it’s there. I think the article in The Independent is fairly well-measured, but Gizmodo took it a bit too far. And in either case, I’m quite sure that lay people reading these articles will walk away thinking the planet’s reality is a given. But at this point, we don’t know. And it’s possible that the planet exists and WISE won’t see it; it may be too dim to spot. There are many variations here. Basically it boils down to only one statement that can be said with certainty: if WISE sees it, it exists. But if it’s not seen in the WISE data, that doesn’t prove anything one way or another; it narrows the possibilities down and gives us an upper limit on how big, distant, and warm the planet might be. But we’d need to keep looking for it. There’s been a spate of overblown stories dealing with astronomy lately (see Related Posts, below). I think this is a coincidence, but it’s certainly keeping me busy. And I’m still not done yet. Stay tuned.